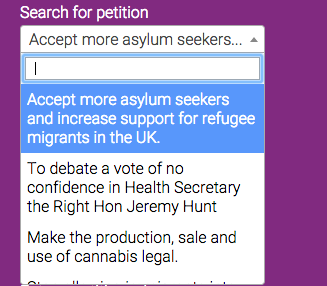 The new Petitions site has been a massive success since its launch this July, with tens of thousands signing petitions each day. It was suggested to me that it would interesting to visualise this data with a heatmap - giving an insight into the popularity of individual petitions across the UK. My aim is that these visualisations are not only interesting but can be of use when focusing campaigns on certain issues around the country. If you find a map you want to share you can use the Share Map button to generate a link or share directly to Twitter or Facebook. 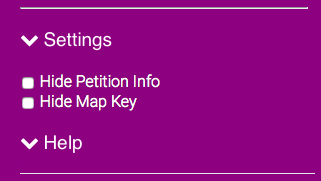 A recent addition to the Petitions site now allows developers to request data in JSON format (by appending .json to any petition url). 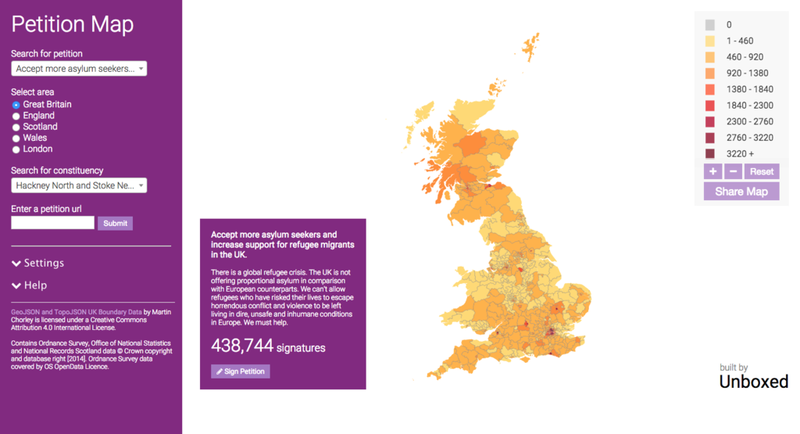 As well as the total number of signatures, each petition holds an array of signatures by country and constituency with the latter being the data used by Petition Map. The ONS code of each is used to match the Petition data with the constituency boundaries. I used boundary data in TopoJSON format, an extension of GeoJSON, which was was sourced from here.